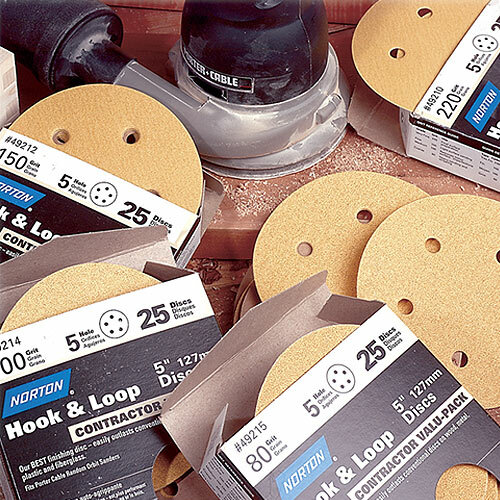 Sanding - Norton Hook & Sand Abrasive Discs - 5 x 8 Hole x 220 Grit - 25 Pk. Norton Hook & Sand Abrasive Discs - 5" x 8 Hole x 220 Grit - 25 Pk. This very fine 220 grit paper from Norton is ideal for extra smooth finish sanding of bare surfaces, and for primer and sealer sanding. Made from premium grade aluminum oxide abrasives, these Norton gold sanding discs are resin bonded to a high performance paper backing. The discs are surface treated to resist clogging, and will not transfer color or contaminate surfaces. Hook & loop backing for speedy and easy disc changes For use on 5" x 8 hole random orbit sanders. 25 discs per pack. Canada.